Good morning, how was your week? I had a happy week, ran some errands, did some sewing, you know, that kind of thing. I'm working on borders and you can catch a glimpse over on my instagram if you're not already keeping up. On to other things. As long as I can remember, which admittedly isn't that long these days, I've been asking my mom for an old icebox cookie recipe she used to make. She'd make these rolls of cookies and put them in the freezer in the garage and we would go out and unwrap and cut off chunks like the wild animals we were. Anyway, all these years she didn't know where it was, then suddenly a couple of weeks ago I mentioned and BAM! Recipe! I don't pretend to know how these things happen but I'm sure someday in the future Frankie will ask me for that stupid tailor's ham and BAM. There it will be. 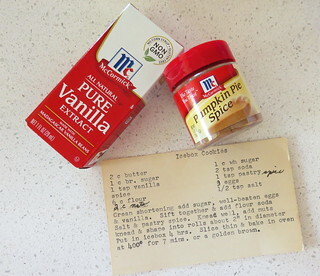 Anyway I wouldn't be jumping on the pumpkin spice bandwagon, but you can see the recipe calls for pastry spice. Of course McCormick's doesn't make pastry spice anymore, but I looked around and found old spice combinations here online. Current day pumpkin pie spice mix contains the same ingredients, no idea if they're the same proportions or not. (and notice the old pumpkin pie spice is different now) But I was trying for something authentic to my childhood and I hoped this would give it to me. Thanks to everyone on Facebook who helped me try and find information on pastry spice! 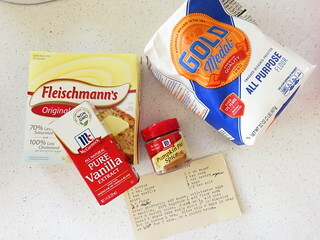 Back in the day we always used Fleishman's or Nucoa for baking. I have a lot of old recipes that call for the brand rather than the product. 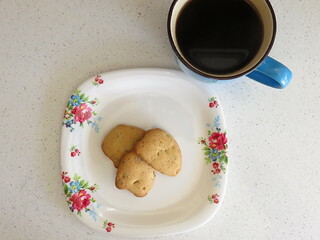 ANYWAY.. this week I made the cookies. I have to say it's pretty close to what I remember. A little less crisp, but I think it's because eggs are so much bigger, maybe next time I'll make them with just 2 eggs. Or buy small eggs. But that will be in the distant future because this recipe makes a million cookies. My log making technique is stale but these little misshapen beauties were delicious. And that first bite of dough transported me back to our garage in Clayton, where I ate my ill gotten gains. It took longer than the 7 minutes, so either my mom's oven was an inferno or that was just an arbitrary number. But hey, it's incidental.. the dough is delicious frozen. There is nothing better then finding an old childhood recipe! They sound delicious. There is a spice company called Penzey's that makes some baking spice blends that may be similar to what you are looking for. They make a pie spice, a cake spice, and a baking spice. They are amazing and add so much to cakes cookies and pies. We received a wedding gift of spices from them and it's been love ever since. Thank you for sharing. Sounds delicious! I just might have to try this recipe. Loved your post, Pam :)!! You still haven't found that damn ham?? ?